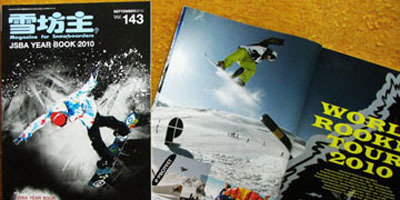 JSBA celebrate the 25th anniversary with its Year Book coming out in September together with “Snowstyle”, the oldest snowboard magazine in Japan, and through its mailing list of 12,000 members who will receive it at home. The Year Book includes all you need know about snowboard schools, resorts, contests in Japan but also articles about safety and education. It also includes a special issue about WSF World Rookie Tour and Swatch TTR Tour. Previous release of this publication were called “JSBA Year Book” but for 2010, to celebrate the 25th anniversary of JSBA, it is presented with the brand new name JSBA “Yukibouzu”: in Japanese “Yuki” means “Snow” and “Bouzu” mean “Kids”.